If you are contacting us over an item you purchased on the eBay marketplace please get in touch through eBay messaging. Please do not email us directly. Please Contact us if you require a different payment method. THIS IS THE BEST CHRISTMAS PRESENT THAT I BOUGHT MYSELF.I DOWNLOAD STUFF FROM THE INTERNET.BUT I HAD A HUGE AMOUNT OF ADDS.THIS DVD STOPPED THE LOT,[FANTASTIC] IF YOU HAVE THE SAME TROUBLE THEN BUY IT. Very good at blocking adverts and pop-up on pages. 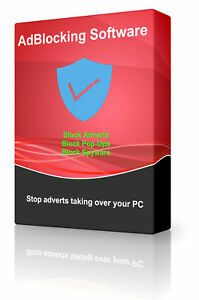 IF you have any problems get in touch but this should block most adverts and if not get in touch we can resolve this problem. Overall excellent ad-blocker.